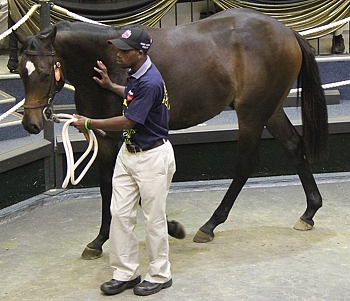 The first day of the 2013 KZN Yearling Sale ended on a hugely positive note. Owing to a number of factors, the sale’s first session ended with the aggregate up R4 000 000 from last year. 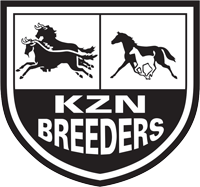 The top-priced KZN-bred colt on the first day came from Scott Bros – an outstanding individual, the dark-bay colt with a handsome face and a big white star sold for R300 000 by Miesque’s Approval to Michel Nairac. Consigned as Lot 158, Melson is a half-brother to Gr 1 Champions Cup winner Orbison who recently returned to race in South Africa from Dubai. Melson has a very strong Highdown Stud pedigree – being out of Foveros mare Blue Bayou. 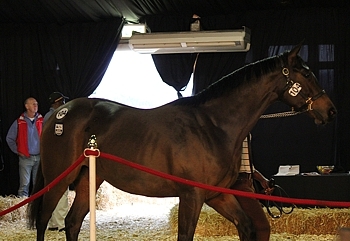 Then top-priced KZN-bred filly came from Backworth Stud, a beautiful dark-bay Muhtafal filly named Superella. 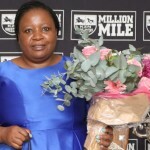 Out of mare Top Speaker by National Assembly, she sold as Lot 104 for R140 000 to Michael Miller. She is a half-sister to 3-time winner From Russia (Russian Revival), and two year old Supreyma (by Admire Main) who has placed from just two starts. This is the family of Marie Galante and Young Rake. Rathmor’s resident sire Strategic News(AUS) has two of his first progeny available on the sale, and his first colt to pass through the ring as Lot 154 sold for R180 000 to Wayne Badenhorst. The colt named K-Rush Em All is out of Bejewelled Beauty (by Rambo Dancer) – therefore a half-brother to Gr 3 placed Awesome Beauty. 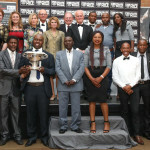 Strategic News won the Gr 1 Summer Cup in South Africa and went onto win over 1600m in Dubai. A big, strong chestnut stallion by Strategic out of a Grand Lodge mare, his progeny are impressive and the two on on offer at the KZN Yearling Sale are well-bred. The next will by a filly out of Giant’s Causeway mare Giant’s Jewel, named Strategic’s Pride. The dam is Gr 2 placed and it is her first foal. 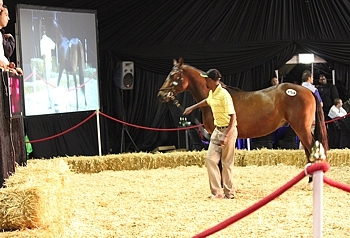 This year, after the first session, the sale’s aggregate was R11 375 000 well up from the same stage last year (R7 055 000). 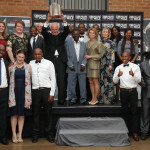 The average showed a handsome rise from the R59 788 in 2012 to R90 278 on Thursday. The median price rose 50% from last year’s price of R40 000 to R60 000 in 2013. A full list of results and statistics are available online.